Gerard Gerardzoon, or Desiderius Erasmus, as he is usually called, was a poor boy, born in the year 1466 or 1467 in Rotterdam in Holland, and educated at the same Latin school of Deventer from which Thomas à Kempis had graduated. He had become a priest and for a time he had lived in a monastery. Erasmus had travelled a great deal and knew whereof he wrote, When he began his career as a public pamphleteer (he would have been called an editorial writer in our day) the world was greatly amused at an anonymous series of letters which had just appeared under the title of "Letters of Obscure Men." In these letters, the general stupidity and arrogance of the monks of the late Middle Ages was exposed in a strange German-Latin doggerel which reminds one of our modern limericks. 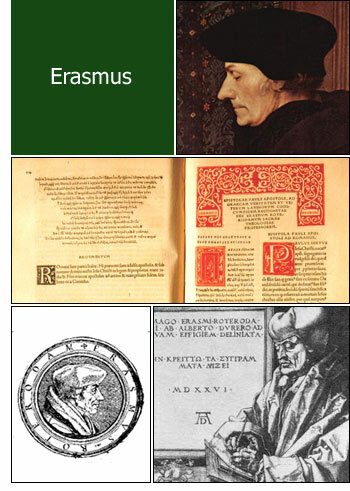 Erasmus himself was a very learned and serious scholar, who knew both Latin and Greek and gave us the first reliable version of the New Testament, which he translated into Latin together with a corrected edition of the original Greek text. But he believed with Sallust, the Roman poet, that nothing prevents us from "stating the truth with a smile upon our lips." In the year 1500, while visiting Sir Thomas More in England, he took a few weeks off and wrote a funny little book, called "Lof der zotheid" ("the Praise of Folly"), in which he attacked the monks and their credulous followers with that most dangerous of all weapons, humor. The booklet was the best seller of the 16th century. It was translated into almost every language and it made people pay attention to those other books of Erasmus in which he advocated reform of the many abuses of the church and appealed to his fellow humanists to help him in his task of bringing about a great rebirth of the Christian faith. But nothing came of these excellent plans. Erasmus was too reasonable and too tolerant to please most of the enemies of the church. Desiderius Erasmus Erasmus died on the 12th of July, 1536.